Coconut water is known to be an abundant and excellent source of essential electrolytes needed, and in this article, we discuss why coconut water is so great – especially during pregnancy. Coconut water has high levels of potassium, chloride and magnesium but not too much sodium or sugar. These electrolytes are necessary for regulating blood pressure as well as assisting in proper functioning of the heart, and studies have shown that coconut water lowers blood pressure when drank regularly. Because of all these benefits, drinking coconut water during pregnancy is safe and absolutely recommended. 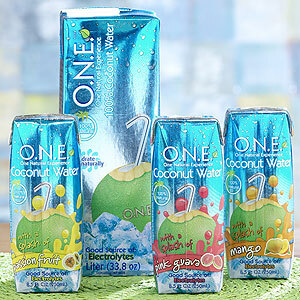 Coconut water is considered as an isotonic beverage that replenishes the fluid. It has a similar pH level to our blood, and contains all of the same electrolytes as our blood too – so it is not seen as a foreign substance that your body needs to “regulate” against. It is also fat-free and cholesterol-free. Similarly, coconut water during pregnancy helps you stay healthy due to some of its antibiodic properties (coconut water is extremely sterile).. Pregnant women often suffer from urinary tract infections. The good news is that due to the antimicrobial properties mentioned above, coconut water is often used to help treat UTIs. It helps in flushing out the toxins out of the body. Leg cramps are caused by potassium deficiency. A pregnant woman is recommended to consume about 4,700 mg and the coconut water provides 670 mg of potassium per 330ml, so this will be a good start to your day on top of all of the potassium you’ll get through your diet. Extra calcium is needed during pregnancy as your baby is building bones which are highly composed of calcium. If you don’t ingest enough calcium during pregnancy, your baby’s bone growth will be stunted, and it will begin to deplete your own calcium stores, which could lead to the weakening of your bones. Avoid this by consuming enough calcium. A serving of coconut water 40mg of this needed nutrient – not a huge dose, but a good start nonetheless. The younger the pregnant mother is, the higher amount of magnesium is needed. 25mg of magnesium can be obtained by consuming 330ml of coconut water. Lauric acid is present in the breast milk as well as in the coconut water. Lauric acid is needed because of its immune enhancer and antimicrobial properties. Aside from it, coconut water helps in successful lactation as it is being stored in the adipose tissue. Those are some specific benefits of coconut water for pregnant women. Aside from those, it is MUCH healthier than the alternatives – soft drinks, juices, or sports drinks that contain high levels of fructose, sugar, and that deadly high fructose corn syrup. Stay away from these if you are pregnant and drink a natural drink like coconut water! Additionally, coconut water is caffeine-free, which is important for pregnant women. So coconut water benefits pregnancy by merely keeping the mother’s body healthy. It is highly recommended to drink coconut water each morning to start the day and reload your electrolytes that were used up overnight. It can also be mixed with saffron or turmeric. Also, the coconut’s white flesh can be consumed as it is also considered good for the health of the mother and the fetus – you NEED saturated fat to develop organs, and coconuts are a great source of saturated fats. Instead of drinking forbidden drinks (soda and coffee) coconut water during pregnancy is a clear replacement.